Every town has its history, and they should try to preserve it as an important part of their heritage. The north coast of Honduras is quite young, and its history is somewhat short, compared to other areas in Central America. But this does not mean that there is not enough heritage to tell a story. The new museum in Tela seeks to tell the story of Tela as a mayor railroad hub in Honduras. Tela was the headquarters of one of the two most important transnational fruit companies in Honduras. The company was the Tela Railroad Company. Its purpose was to produce and export bananas to the world. To do so, they built a railroad network to transfer bananas from the fields to the port of Tela. There, they shipped the bananas on cargo ships to the United States. This vast railroad network went as far as west as the city of San Pedro Sula. Many important stations were on the route, including those in the cities of El Progreso, Santa Rita de Yoro, Potrerillos, Pimienta, Villanueva, Puerto Cortes and La Lima. The railroad network included bridges over the mighty Ulua, Chamelecon and Humuya Rivers. These rivers all flow into the Sula Valley. To the East, it interconnected with the Standard Fruit Railroad Company. Their headquarters are still in La Ceiba. Together, these two companies shaped modern Honduras. together, they created the original Banana Republic in Central America! The Lancetilla River divided the city in two distict areas. The American area was on the West side of the River. The Tela Railroad Company had its headquarters in Tela. The Lancetilla River divided the city in two. To the West was Tela Nueva. This was the “American” part of town. The administrative offices, as well as the foreign executives and workers lived in this area. The result was a unique architecture known today as Banana Era Architecture. Most buildings are made from wood, zinc roofs and have large outdoor porches. The Old Accounting Building is now a Museum in Tela! Without doubt, the most important building from that glorious past is the accounting building. It faces the beach, almost across the old dock. In the old days, this was the heart of the operation. The train with the pay check for all the employees in the vast territory departed from here every week. In the days before computers, many workers were needed to keep tabs on payments. All payments where in cash or tokens for the banana company stores. The old building, that dates back to 1916 was abandoned when the company moved its headquarters to La Lima in the 1960s. 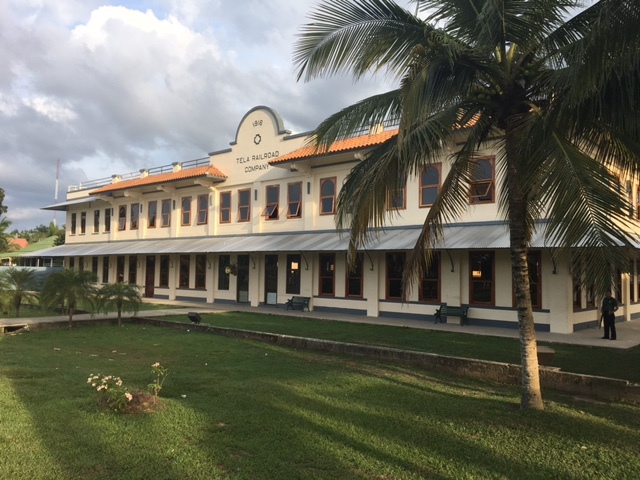 The current major of Tela, has done an outstanding job renovating this building. It is without doubt the pride and joy of Tela. The plan is to establish a museum within this building, thus creating the first Museum in Tela! Currently the museum houses a variety of old railroad items from the abandoned railroad tracks. To be honest, they have not yet been assembled in a way that they can be presented as a museum. However, they are interesting and a window to the past of Tela and the Banana Companies. 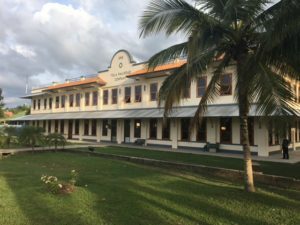 The building itself can give an idea of size of the operation that the Tela Railroad company had during the first half of the past century. This new museum in Tela is open Friday to Sunday from 2 p.m. till 9.00 p.m. It offers a chance to see into the past of Honduras in general. I thoroughly recommend a visit. If you get caught by a rainy day on the beach and do not know what to do, by all means, visit the new Tela Museum. The Accounting Building and the Old Dock are a Perfect Match! 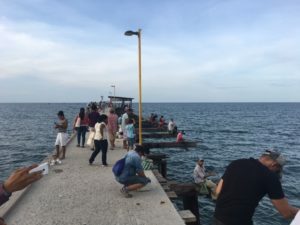 The Tela Dock is a popular get together spot for the locals. A visit to the Museum without a visit to the old dock is not complete. In the old days, cargo ships would depart loaded with bananas. The old dock was unfortunately victim to a fire. It has been partially rebuilt and is a popular spot for locals to go fishing. Today, the dock is used only to unload fuel to the storage terminals located on the outskirts of town. 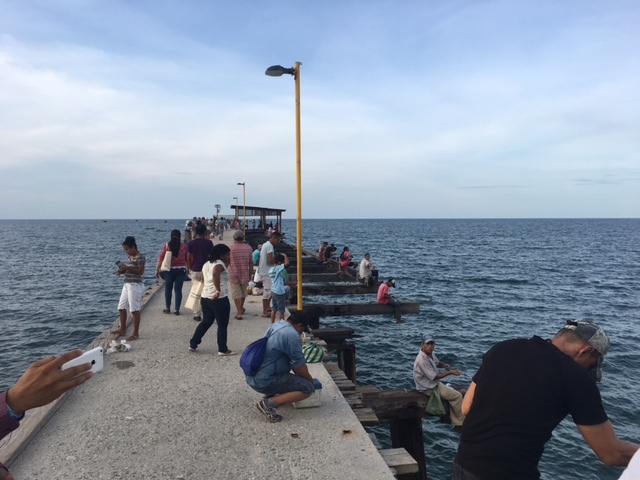 On any random day, you will find dozens of Tela natives trying their luck fishing. They all fish with the hope of going home with some fresh catch and enjoy a good dinner with the family. 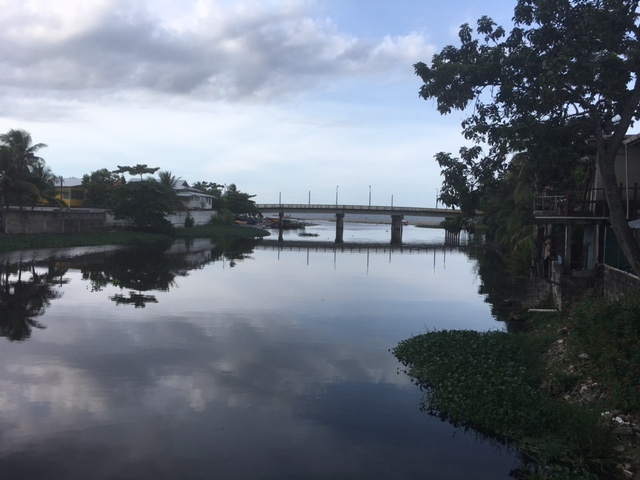 I am happy to report that it is safe to walk between your hotel in downtown Tela to the dock and the old Tela Railroad Company accounting building. It is interesting to note that the Telamar Resort is on the old residential complex where the Banana Company executives lived. Here you can still find many of the old homes and buildings standing. The Telamar Golf Course is the old Tela Railroad Company Golf Course. You can imagine the life that these foreign executives enjoyed in Tela. They even had their own golf course! If you have an interest in the Banana heritage and railroads in Honduras, here are a couple of places to visit. The Swinford Park in La Ceiba offers a nice setting with some of the old railroad units. These were part of the Standard Fruit Railroad Company. The City of El Progreso, near San Pedro Sula, has opened a railroad museum. More than a museum, it is a nice park with a great collection of old railroad paraphernalia.